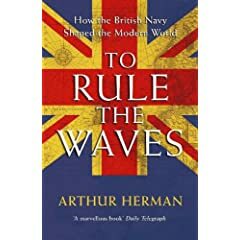 I finally finished Arthur Herman's To Rule the Waves: How the British Navy Shaped the Modern World — the first bit of nonfiction I've taken on in a while. It was somewhat of a slog at times, but never without a payoff. Herman's book recounts the history of the Royal Navy from its early days as a ragtag assembly of privateers raiding Spanish treasure fleets  at that point, hardly a "navy" at all — to its final active combat mission off the Falkland Islands in 1982, well after it had ceded control of the seas to a younger, more dynamic American fleet. At the same time Herman tracks the rise and decline of Great Britain as a world power and describes the enduring impressions the British people made the world over, principally through their exercise of sea power. To Rule the Waves nicely balances its argument and factual presentation with history-by-anecdote, and so it manages to inform and entertain in equal parts. Herman kicks off his work with a relation of John Hawkins's daring and desperate raid on San Juan de Ulloa, a Spanish installation in the Caribbean, in 1568. Robert Louis Stevenson could have written passages in this chapter, and they'd be no more compelling. Interwoven with battle narratives like these are more complex disquisitions on the Longitude Problem and the several overhauls and reorganizations of the Admiralty. A succession of larger-than-life personalities make up half the story here: Hawkins gives way to Drake, and from there Pepys, Anson, Hawke, Cook, Nelson, Cochrane, Fisher, Jellicoe, and Churchill, serving in a dual capacity as both historical figures and characters, all propel the plot forward in furious bursts. The other half of the story, in which the Navy's power grows incrementally with technological, organizational, and regulatory improvements, provides a kind of consistent backbeat that steadies Herman's prose. At times Herman's enthusiasm for his subject matter seems to slip a bit, into unalloyed admiration of the actual Navy and, by Herman's metonymic argumentation, of Britain itself. The effect of this is incremental: by the end of the book any reasonable reader must, at least momentarily, regret that the sun should ever have set on this Empire. We're told that the press gangs weren't so brutal, and that Churchill probably overstated the extent of the "buggery" and the use of the "lash." We're told of the commercially favorable world order that the Royal Navy oversaw, not just on behalf of Britain — but for all nations. The word "empire," with all its negative connotations, does not surface very often. Herman prefers to talk of a Pax Britannia. Blame for the Navy's several notable defeats and reversals — it's all right, Arthur, nobody can win all the time — is with a kind of suspicious frequency lifted from the shoulders of the admirals and captains and laid at the feet of government mismanagement or Britain's lagging allies. Conversely, a recurring theme of the book is that the Navy (and Britain, and the world) thrived on its own mystique, such that the very appearance of a British ship in a port would be sufficient to quell a local crisis, and the Continent's wretched imperialists, French and Spanish alike, could not but turn their fleets away from near-certain victories out of deference to the Navy's indomitable presence. And I'd have gotten away with it, too — if it weren't for those meddling English ships! The gushing suggests at times that Herman has abandoned objectivity altogether. But these biases do not detract from the book's learning, and if anything they are useful, because they remind the reader that there is a motivated author here: I found myself skeptical at times, but never cynical, and that's probably the best state of mind in which to read a work of history. For that matter, it's refreshing to read a work on this subject that does not get bogged down completely in lamenting the evils of empire. That's well-traveled territory — and deservedly so — but surely the upside of British power (such as it was) is a subject worth exploring, too. Maybe Herman's tendency to extend the benefit of the doubt is catching. There are other possible explanations for the choices Herman makes. I gather that historians make much of their hay in "mythbusting," and it might be that motivation — challenging conventional understandings about the Navy, Churchill's bon mot being just one very reductive example — that drives some of Herman's more apologetic passages. As for his tendency to forgo criticism of Britain's imperial excesses, this might just be a result of the fine parsing of his subject matter: it became apparent to me as I read that the principal occasions for postcolonial complaint occurred on shore. The subjugation, the exploitation were, for the most part, out of the Navy's jurisdiction. The admirals may have been enablers, and there is complicity there, but by holding his focus on the Navy, Herman is able to emphasize what Britain gave the world over three centuries — most notably, the fruits of global exploration and navigation technology, security and support for international trade that drove economic growth, and a commitment to the human values and freedoms and rule of law that we continue to promote today. In the end, then, it should not be so troubling that the Navy occasionally resorted to press gangs to crew-up its ships, when at the same time it was undertaking systematic efforts to wipe out the African slave trade. And maybe that's where I'll leave this. A dense but rewarding read, and I strongly recommend it.